"We believe a timely, concerted effort on the part of these three agencies [DOE, FBI, CIA] would have greatly aided and possibly solved the NUMEC diversion questions, if they desired to do so." "Advise GAO that we cannot declassify our report because of the need to have a coordinated Executive Branch position and our desire to protect a sensitive and valuable liaison equity." 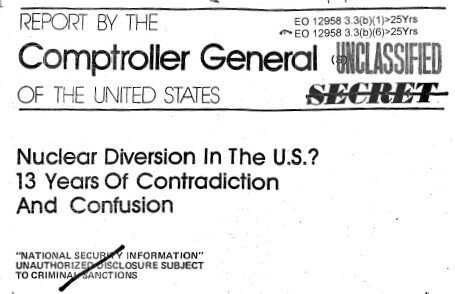 * An earlier GAO report titled "Review of Accountability Controls Over Special Nuclear Materials, Nuclear Materials and Equipment Corporation," Report to Joint Committee on Atomic Energy by the Comptroller General of the United States, June 1967 may be viewed in the NUMEC archive.